Cape Town is a top tourist destination all year round. While the summer months tend to have more days of sunshine with higher temperatures; spring and autumn can be lovely too and have the benefit of little to no wind to ruffle your feathers. Winter is definitely the wet season, but this does not mean that every day is cloudy and cool. In fact, many winter days are beautifully clear and mild. Cape Town has a Mediterranean climate, which means it is a winter rainfall region. The rest of the country mostly has summer rainfall. So, if you are planning on combining a visit to Cape Town with a safari in the more northern areas, this may be worth bearing in mind. Regardless of the season – there is always something fun to do in Cape Town and to make your decision-making process a little simpler – we set out the advantages and disadvantages of each season. Spring months are September, October and November. Coming to Cape Town in the spring time can be a clever choice. Prices for holiday rental accommodation tend to be lower and availability for properties is much higher. There is a school holiday in the beginning of October, so make a note of that if you’re South African. The weather around this time tends to be mild and once in October, the temperature starts rising. Generally, you can expect around 22℃ on an average day. You may occasionally find clouds gathering for a quick shower but the rain won’t go on for days. Even though you may not be able to go to the beach every day, there will certainly be some days when you will be able to put on your bathing costume. If you really prefer the heat and would like to get as much sunbathing done as possible, then November would be a good choice. Really the beginning of summer, November temperatures average at around 24℃. There may be some cooler days, but the majority will be warm and could become even warmer. This is not yet peak holiday season and the city is not as full as during the December holidays. One of the big attractions of Cape Town in the spring are the flowers. The magnificent annual display of spring flowers happens around September and you can expect to see large fields transformed in beautiful canvases of colour next to the road heading out from Cape Town and further north along the West Coast. Summer months are December, January, and February. Summer is generally the time when most tourists come to Cape Town. The days are hot and the nights are balmy. Temperatures can rise up to 30℃ and can go even higher in February. For those looking for a beach holiday or lounging beside a swimming pool, the summer months are ideal. The only downside is that it can get very busy at this time of year. Local as well as international visitors flock to the city during December, when the schools close and everyone wants a bit of beach time. This is peak or high season and accommodation often needs to be booked way in advance to avoid disappointment. If you are flexible in terms of your dates, then consider coming in January. The schools usually re-open in the first or second week of the month and after that holiday rental availability increases significantly. February is often the hottest month of the year, with temperatures hovering around 30℃. It could become hotter too – which may be terrific beach weather but for heat-sensitive folks, it could be too hot. Don’t forget that summer can also be quite windy in Cape Town. Autumn months are March, April and May. If you are planning a holiday to Cape Town, autumn may be the right time for you. The weather tends to be very warm in March as well. In fact, sometimes March can rival February when it comes to the hottest days of the year. By April and May, you can start to see cooler weather and more clouds. Autumn is actually an excellent time to come to Cape Town as there are fewer tourists about, but the weather is glorious on most days. There is parking, restaurants aren’t fully booked and it is much easier to get around in the city. Not to forget that as this is regarded either as low or mid-season – prices and availability of holiday accommodation are much more favourable too. April has a short holiday over the Easter period and at this time holiday rentals are more popular. So, if you are thinking of coming in April, perhaps check the dates of the local school holidays (which tend to be at the beginning of April). For those who like warm weather, March is known to have many wind free, sunny days. 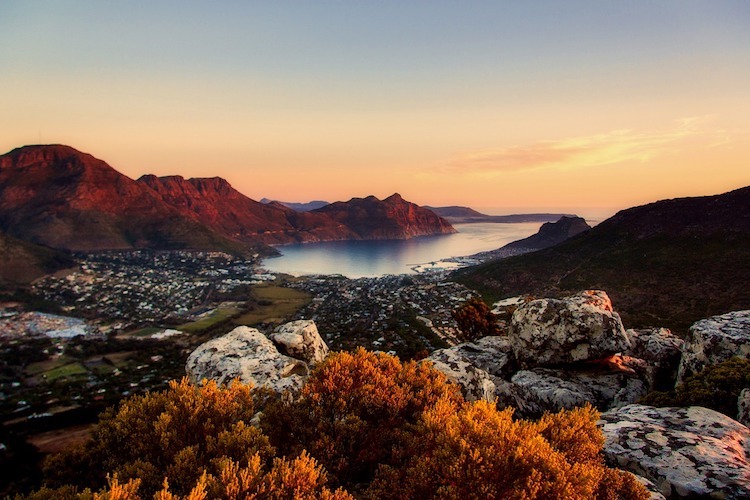 Walking fans are in for a treat as Cape Town has numerous trails in the mountains and nature reserves in and outside of the city. Walking up Table Mountain, for instance, is a scenic way to reach the top of this city landmark. Autumn is the best place for those with hiking in mind as the weather is not so hot and the days as crisp and ideal for walking. Winter months are June, July and August. Winter in Cape Town is characterised by cooler temperatures of around 18℃ and rain. While there can be storms, the rainy weather tends to occur over one to three days as cold fronts travel inwards. In between the rainy days, however, there are often perfectly nice sunny days, with no wind, when sightseeing is simply the best. Billed by many as “the secret season”, because it can offer tourists really stunning days, winter in Cape Town has its own appeal. Holiday accommodation in Cape Town is no problem to find at all and often available at discounted rates. Photographers and painters will love the moody atmosphere and romantic lighting. Don’t forget the charm of cosy fireplaces and sipping red wine while watching the sunset over the ocean, playing board games or cards with the kids and creating unforgettable winter family times. Winter and early spring is the best time to see the southern right whales come to the shores of southern Africa to mate and calve. There are several spots around Cape Town where whales can be seen either from boasts or from land-based spots and it is a magical experience. If you are planning a holiday in Cape Town, there are so many considerations when it comes to booking your holiday accommodation. Cape Town accommodation has many options for visitors: from luxurious villas on the beach to elegant holiday apartments with breathtaking views and/or swimming pools in superb locations around the city. For beach weather, February and March can be much better than December. November is also a very good month for beach holidays. Mid-to-end January will be less busy as locals return to work (and school). Some visitors return to Cape Town year-after-year, choosing the same accommodation, frequently booking far in advance. If your choice of accommodation is important, then it may be a good idea to change your Cape Town dates to early autumn or late spring – when finding the perfect holiday spot is a synch. If you are still undecided, why not contact the vacation experts at Cape Town Villas for travel and holiday accommodation advice? Our team has years of experience in putting together dream holidays for visitors from all over the world. We would be happy to help you put together the holiday of a lifetime. Alternatively, take a look at our extensive Cape Town accommodation portfolio with luxurious villas and apartments for rent in prime areas in and around the city. If you are visiting with a group of you friends or members of your family, take a look at our helpful guide with tips on choosing the best accommodation in Cape Town for a large group. Cape Town Villas guarantees you the lowest rate on villa accommodation. And all our rentals offer space, privacy, hotel conveniences, and 24/7 local guest support.